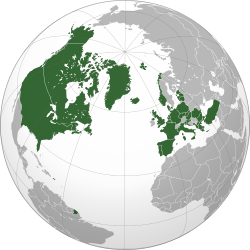 The North Atlantic Treaty Organization (NATO; /[unsupported input]ˈneɪtoʊ/ NAY-toh; French: Organisation du traité de l'Atlantique Nord (OTAN)), an aa cried the (North) Atlantic Alliance, is an intergovrenmental militar alliance based on the North Atlantic Treaty which wis signed on 4 Aprile 1949. The organization constitutes a seestem o collective defence wherebi its member states agree tae mutual defense in response tae an attack bi ony external pairty. NATO's heidquarters are in Brussels, Belgium, ane o the 28 member states ower North Americae an Europe, the newest o which, Albanie an Croatie, jyned in Aprile 2009. An addeetional 22 kintras participate in NATO's "Partnership for Peace", wi 15 ether kintras involved in institutionalized dialogue programs. The combined militar spendin o aw NATO members constitutes ower 70% o the warld's defence spendin. For its first few years, NATO wis nae much mair nor a poleetical association. Houiver, the Korean War galvanized the member states, an an integratit militar structur wis biggit up unner the direction o twa US supreme commanders. The course o the Cauld War led tae a rivalry wi naitions o the Warsaw Pact, which formed in 1955. The first NATO Secretar General, Lord Ismay, statit in 1949 that the organization's goal wis "tae keep the Roushies oot, the Americans in, an the Germans doun." Doubts ower the strength o the relationship atween the European states an the Unitit States ebbed an flowed, alang wi doubts ower the credibility o the NATO defence against a prospective Soviet invasion—doubts that led tae the development o the independent French nuclear deterrent an the widrawal o the French frae NATO's militar structur in 1966. Efter the faw o the Berlin Wall in 1989, the organization acame drawn intae the breakup o Yugoslavie, an conductit thair first militar interventions in Bosnie frae 1992 tae 1995 an later Yugoslavie in 1999. Poleetically, the organization soucht better relations wi umwhile Cauld War rivals, which culminatit wi several umwhile Warsaw Pact states jynin the alliance in 1999 an 2004. The September 2001 attacks signalled the anly occasion in NATO's history that Airticle 5 o the North Atlantic treaty haes been invoked as an attack on aw NATO members. Efter the attack, troops wur deployed tae Afghanistan unner the NATO-led ISAF, an the organization continues tae operate in a range o roles, includin sendin trainers tae Iraq, assistin in coonter-piracy operations an maist recently in 2011 enforcin a no-fly zone ower Libie in accordance wi UN Security Council Resolution 1973. The less potent Airticle 4, which merely invokes consultation amang NATO members haes been invoked three times, an anly bi Turkey: ance in 2003 ower the Seicont Iraq War, an twice in 2012 ower the Sirian ceevil war efter the dounin o an unairmed Turkish F-4 reconnaissance jet an efter a mortar wis fired at Turkey frae Sirie. ↑ "The official Emblem of NATO". NATO. Archived frae the oreeginal on 27 May 2012. Retrieved 20 February 2008. ↑ "The SIPRI Military Expenditure Database". Milexdata.sipri.org. Retrieved 22 August 2010. ↑ "Invocation of Article 5 confirmed". North Atlantic Treaty Organization. Retrieved January 29, 2013. ↑ Croft, Adrian (3 October 2012). "NATO demands halt tae Syria aggression against Turkey". Reuters. Retrieved 3 October 2012. Wikimedia Commons haes media relatit tae North Atlantic Treaty Organization. "NATO collectit news an commentary". The Guardian. This page wis last eeditit on 14 September 2018, at 19:17.